Solar panels use the energy from the sun to convert light into electricity. A solar panel helps in collecting solar energy so that it can be used to fulfill general daily electricity requirements. By using solar energy, you can keep your power bill low and save the planet by reducing carbon emissions. With an ALEKO brand solar panel, you can be sure that you’re getting the best solar technology for your money. 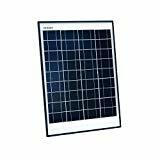 ALEKO’s solar panel has a nominal output voltage of 24 volts, and is a 20 watt panel. The aluminum frame is specially produced for ALEKO solar panels and is designed to provide a perfect balance of technology, style and function. Low iron tempered glass has high impact protection and high light absorption, and the panel uses monocystalline silicon which is unparalleled in energy efficiency. Product dimensions: 19 x 13.5 x 1 inches.